"SOHO has a view of about 12 and a half million miles beyond the sun," said Joe Gurman, the mission scientist for SOHO at NASA's Goddard Space Flight Center in Greenbelt, Maryland. "So we expected it might from time to time see a bright comet near the sun. But nobody dreamed we'd approach 200 a year." In 1995, a new solar observatory was launched. A joint project of ESA and NASA, the Solar and Heliospheric Observatory – SOHO – has been sending home images of our dynamic sun ever since. SOHO was planned to open up a new era of solar observations, dramatically extending our understanding of the star we live with. . . and it delivered. But no one could have predicted SOHO's other observational triumph: In the last two decades, SOHO has become the greatest comet finder of all time. In August 2015, SOHO is expected to discover its 3000th comet. Prior to the SOHO launch, only a dozen or so comets had ever even been discovered from space, and some 900 had been discovered from the ground since 1761. More than just a celebrated bright vision in the night sky, comets can tell scientists a great deal about the place and time where they originated. Comets are essentially a clump of frozen gases mixed with dust. They are often pristine relics that can hold clues about the very formation of our solar system. On the other hand, if they have made previous trips around the sun, they can hold information about the distant reaches of the solar system through which they've traveled. We have a variety of tools to determine what comets are made of from afar. One is to watch how material evaporates off its surface when it comes close to the sun, and here's where SOHO can provide remarkable information. SOHO is unique in that it is able to spot comets that skim extremely close to the sun, known as sungrazers. One of SOHO's instruments, called a coronagraph, specifically blocks out the bright light of the sun to examine its atmosphere – which is a billion times fainter than the star itself. To this day, SOHO is one of our best sources for views of the giant explosions regularly produced by the sun called coronal mass ejections, or CMEs, which can hurl a million tons of solar particles off into space. This field of view is large enough to see a sungrazing comet as it sling shots around the sun. The overwhelming bulk – some 85% — of SOHO's comet discoveries are what's called Kreutz comets. Scientists think a single extremely large sungrazing comet broke up thousands of years ago, leading to thousands of leftover fragments, which continue to follow the same Kreutz path. On average, a new member of the Kreutz family is discovered every three days. Unfortunately, the long journey for these fragments invariably ends as they pass the sun. If they're close enough to the sun to be seen by SOHO, they're too close to survive. "They just disintegrate every time we observe one," said Karl Battams, a solar scientist at the Naval Research Labs in Washington, D.C., who has been in charge of running the SOHO comet-sighting website since 2003. "There's only one Kreutz comet that made it around the sun – Comet Lovejoy. And we are pretty confident it fell apart a couple of weeks afterwards." Other, non-Kreutz comets have survived, however. One frequent visitor is comet 96P Machholz. Orbiting the sun approximately every 6 years, SOHO has now seen this comet four times. Such comets survive by virtue of the fact that they don't travel as close to the sun – so they experience less intense solar radiation and are not subject to gravitational stretching and pulling from the sun. Information about the composition of comets is something SOHO can help with. Depending on how a comet reacts to the sun gives clues about the very substance out of which these visitors from the outer solar system are made. 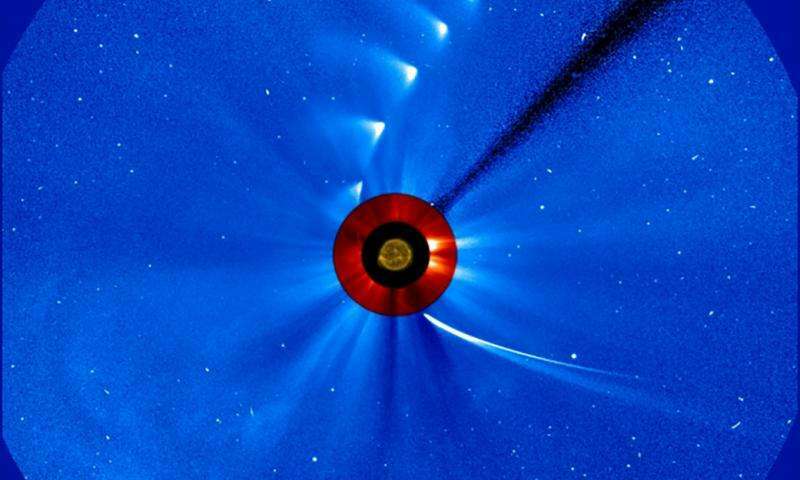 Watching these sungrazing comets also help us learn about the sun. Their tails of ionized gas illuminate magnetic fields around the sun, so they can act as a tracer that helps scientists observe these invisible fields. Such fields have even ripped off comet tails allowing astronomers to watch the lost tails blowing in the steady outpouring of solar particles streaming off the sun. The tails act as a giant windsock in this solar wind, showing researchers the details of the wind's movement. SOHO's great success as a comet finder is, of course, dependent on the people who sift through SOHO's data – a task open to the world as the data is publicly available online in real time. A cadre of volunteer amateur astronomers dedicate themselves to searching the data via the NASA-funded Sungrazer Project. While scientists often search the imagery for very specific events, various members of the astronomy community choose to comb through all the imagery in fine detail. The result: 75% of SOHO comets have been found by these citizen scientists. Whenever someone spots a comet, they report it to Battams. He goes over the imagery to confirm the sighting and then submits it to the Central Bureau for Astronomical Telegrams, which gives it an official name. While comets spotted from the ground are named after the person who first discovered them, comets first observed by a space-based telescope are named after the spacecraft. "As I joined the team when we already had found 500 comets, I've been in charge of confirming 2,500 so far," said Battams. "I think it's safe to say I've looked at more images of comets than any other person in history. Each comet is visible in at least 15 images, so that's more than 40,000 images of comets." One of the more well-known comets observed by SOHO is Comet ISON, seen in the this time lapse photo from Nov. 28, 2013 at the top of the page. Comet ISON comes in from the bottom right and moves out toward the upper right, getting fainter and fainter. The image of the sun at the center is from NASA's Solar Dynamics Observatory. SOHO has also helped provide images for comets discovered by others. In 2012, a sungrazer was found the old-fashioned way – from the ground. Known as Comet ISON, scientists quickly realized it would make a swing by the sun close enough to be spotted by a variety of solar telescopes including SOHO. A large campaign of observations was launched, as telescopes from around the world and across the solar system watched the comet — a fossil from the original days of the solar system formation – sweep in. The final observatory to see Comet ISON was SOHO, which watched the comet curve in toward the sun. . . and disintegrate. Observations from SOHO were key to helping describe ISON's last hours – something that no other observatory captured. "When SOHO launched, its sensors were some 100 times more sensitive than previous imagers," said Gurman. "That was crucial to seeing the faint light from the solar particles in a CME. SOHO allowed us to see a range of brightness and details never before seen. It was great luck that the same exposures allowed us to see comets – not just extremely bright ones, but a whole range of fainter ones, too." At almost 20 years old, the SOHO mission is a respected elder in NASA's Heliophysics System Observatory – the fleet of spacecraft that both watch the sun and measure its effects near Earth and throughout the solar system. SOHO is a cooperative effort between ESA and NASA. Mission control is based at NASA Goddard. The Large Angle and Spectrometric Coronagraph Experiment, or LASCO, which is the instrument that provides comet imagery, was built at the Naval Research Lab in Washington, D.C. Transit of Venus –"A Model for Exo-Planet Detection"